Social Security Credits for Moms? Dramatic changes in the U.S. family structure over several decades – more divorce, single motherhood, and unmarried couples – could have a big impact on the financial security of baby boomer women as they march into retirement – and on future retirees. A review of studies on Social Security spousal and survivor benefits by the Center for Retirement Research, which sponsors this blog, examines the difficulty of providing retirement security for the growing ranks of women and mothers who do not fit the traditional family mold. Social Security’s benefits were designed for the typical family when the pension program was enacted in the 1930s, a family portrayed at the time by Henry Barbour and his wife, Fanny, in the popular radio soap opera, “One Man’s Family.” A spouse, usually the wife, is guaranteed half of her husband’s full retirement age benefit under the program when she reaches her full retirement age – whether she works or not. When her husband dies, her survivor benefit equals his pension benefit. But women who marry and become divorced within 10 years are not eligible for these benefits. Nor, of course, are single working women, who receive benefits based solely on their own work histories. Increasing numbers of women reaching retirement age today either were in short-term marriages or never married and won’t receive a spousal or survivor benefit. The problem is that most of these women are mothers. Child-rearing responsibilities typically limit the hours that mothers can devote to working or pursuing careers and pay increases. Yet their earnings records – the 35 years of their highest earnings – are the basis for calculating their own worker benefits under Social Security. These benefits aren’t always enough to keep these women out of poverty in old age. 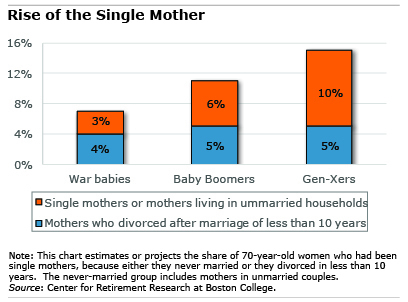 The Center’s report suggests that it might be time to consider reforms that help single and divorced mothers. One revenue-neutral proposal would eliminate spousal benefits and increase mothers’ monthly Social Security checks through caregiving credits, which would increase the earnings base for calculating their benefits. 4 Responses to Social Security Credits for Moms? “…and 3) reduce each spouse’s benefit at retirement to fund a survivor benefit equal to two-thirds of the couple’s combined benefit.” I suspect there would be a lot of resistance to this. The intent is clear enough, but people would not take well to it. I am not sure that we should do anything to encourage or support out of wedlock births. That trend has so many negative consequences on our society. Are they going to be paying into the Social Security Trust fund just like I have too? The answer is probably no…then they should not be entitled to get anything out of it. This is why the trust fund is going broke. Too many people getting money from SS that never contributed a dime to it. Ridiculous BS. Social Security provides benefits for two types of people who do not make contributions to the program: 1) non-working spouses who receive spousal or survivor benefits based on their spouse’s work history; and 2) children who receive survivor benefits based on a deceased parent’s work history. All other recipients of Social Security benefits have paid into the program over their working lives, including recipients of Social Security disability benefits, who must meet age-based minimum requirements for years of work in Social Security-covered employment.